“The Cry of the Peacock in the Night” marks the springboard into a major youth project that addresses issues that affect each and every one of us. What constitutes ‘Origin’? Is it ancestry, the social environment, a country, a religion, a town? Is it membership of a particular group? Is it one’s personal trajectory, the sum of individual decisions and strokes of fate? In a guided research project lasting a number of weeks, young people will look at these questions from a musical as well as biographical viewpoint. How might we go about making deeply embedded hearing habits audible to others and sensitising other people’s ears to the sounds of one’s own provenance? Artistic direction of the project is in the hands of Bernarda Horres. The director is equally at home on theatre and opera-house stages and has had engagements with the Schauspiel Köln, the Ruhr Festival in Recklinghausen, the Sophiensaele, the Landestheater Linz and the Staatsoper Hannover, among others. In 2016 she directed the SOMETHING I’VE ALWAYS WANTED TO SAY project in the Tischlerei, Deutsche Oper Berlin. 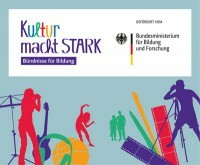 „The Cry of the Peacock in the Night“, supported by „Zur Bühne“, the programme of Deutsche Bühnenverein „Kultur macht stark. Bündnisse für Bildung“.